The resume is dying, and the folks at Innovate CV know just what should take its place. On Wed. March 17, 2013 the company launched a new, innovative product designed to “re-invent” the job application process —Apploi. “The resume is redundant, and Apploi is the new job application. It’s mobile, interactive, and intuitive,” Adam Lewis, Innovate CV and Apploi founder, said. 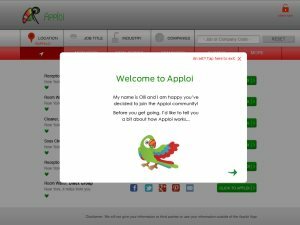 Apploi, which is currently focused on the service and support industry, allows companies to add jobs and then create custom templates and questions for job applicants to fill out and answer. Passport – Candidates enter their basic information and only have to do this once so they can swipe right through each time when using Apploi. Colors Shine – This is tied to specific templates that hiring companies create. Targeted questions can be answered in multiple formats (video, audio, text, multiple choice, competency sliders, and more). Around 120 attendees gathered for the official launch of the new product. The event began with a panel by industry experts, including Lewis, author of Job Searching with Social Media for Dummies Joshua Waldman, and Co-Founder of Facebook and MyBarackObama.com Chris Hughes. The men discussed everything from how technology has affected the way people communicate to the importance of mobility in the job and talent search arenas. Founder Lewis and SVP Georgina Narich then demonstrated just how to use Apploi. The night’s festivities ended with the official launch of Apploi, complete with a “jungle” representing the fun and creative vision of the app and a real-life parrot, symbolizing the app’s mascot. “From the feedback we’ve received in the past few days, many industries have been waiting for a solution like Apploi,” he said.